With the world changing rapidly, global currencies are often fluctuating due to positives and negatives in the international economy. This fluctuation leaves some countries with a high level of uncertainty in the strength of their financial and political systems. As a result, we have seen a massive increase in foreign investment in U.S. real estate. Smart brokers and agents are seizing this moment by thinking globally when it comes to their real estate business. People frequently ask me about my international clients. Colleagues want to know where they are coming from, what they are buying and why are they investing in the U.S. Many choose to invest in a U.S. portfolio because our financial markets are efficient, liquid and highly developed. The institutions and corporate governance are strong, which gives foreigners more peace of mind. From April 2013-March 2014, international buyers bought $92.2 billion in US real estate. In fact, from April 2013 to March 2014, a total of $92.2 billion in U.S. real estate was purchased by international buyers. In short, international buying activity is fueled by the strength of our economy, rising affluence and a desire to preserve capital. 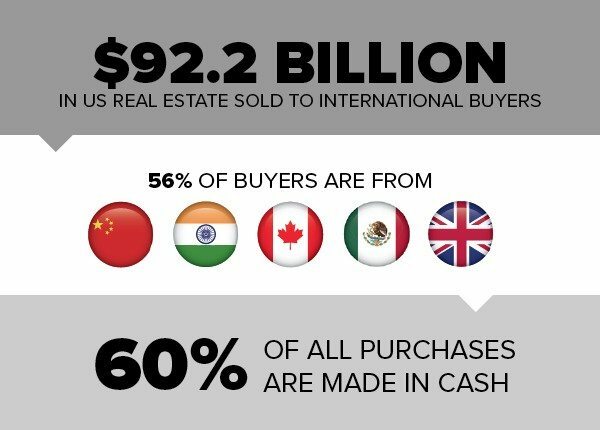 Countries including China, India, Canada, Mexico and the United Kingdom are investing heavily in U.S. real estate — with 60 percent of the purchases made in cold hard cash. These countries’ purchases equated to 54 percent of the total — and it’s interesting to see what people are buying. The Chinese bought in the higher-price-point markets such as California, New York City and Washington, D.C., whereas the Canadians bought in the lower-priced markets such as Florida and Arizona. Of purchases made in California, Arizona, Florida and Texas, 55 percent were driven in part by the rise in technology sector jobs. We see this trend of course in our Silicon Valley. Here in California 62 percent of our foreign buyers were from Asia. Here in California, 62 percent of our foreign buyers were from Asia, with 70 percent favoring single-family homes in the suburbs; 20 percent favoring condos in the city; 50 percent purchased as a vacation home or rental homes; and 40 percent purchased as a primary residence. In addition to providing a solid and safe investment, the incredible opportunities that exist in the U.S. are a draw. These opportunities, including excellent education, freedom and financial security, have brought foreign buyers here in droves. So how do you market yourself to foreign buyers? First, tap into your existing network. Many purchases are made through referrals from friends, family and past clients. Think globally and connect with brokers in foreign markets through email and social media to build a global referral network. Also, keep in mind that when an opportunity presents itself to work with a foreign buyer, you need to be ready to manage the transaction. To get you started, I suggest you read some books about doing business with different cultures. One I’ve read and highly recommend is “Global Business Etiquette: A guide to international communications and customs” by Jeanette Martin and Lillian Chaney. Your knowledge of cultures, religions and foreign business practices will set you apart from the rest of the pack by making you more likable, relatable, knowledgeable and professional. This differentiation will lead to closing more transactions, which will translate into what we all love — more commission. Think globally — it’s the only way to think in real estate. Watch Roh Habibi on “Million Dollar Listing San Francisco” Wednesdays 10/9 p.m. Central on Bravo. Roh Habibi stars in “Million Dollar Listing San Francisco,” the latest installment to the Bravo reality dynasty. Follow Roh on Twitter and on Facebook.